Posted on 11, October 2016 by EuropaWire PR Editors | This entry was posted in Electronics & Machinery, Germany, Industrial and tagged Arburg, CHINA, Gerhard Böhm, Renate Keinath, subsidiary in Shenzhen, Zhao Tong. Bookmark the permalink. Managing Partner Renate Keinath (2nd from left) congratulated Zhao Tong (left), Managing Director of the Arburg organisations in China, on the anniversary. Also in the picture: Managing Director Sales Gerhard Böhm (2nd from right), together with Katie Xue and Ye Li (from the right). LOSSBURG, 11-Oct-2016 — /EuropaWire/ — On 23 September 2016, Arburg celebrated the ten-year anniversary of its Chinese subsidiary in Shenzhen together with around 200 invited guests. A high-profile delegation from the German headquarters travelled to China to attend the exclusive evening event. Managing Partner Renate Keinath and Managing Director Sales Gerhard Böhm thanked Zhao Tong, Managing Director of the Arburg organisations in China, together with his team for their great commitment and the customers for their long-standing trust in the company. The evening’s highlights included the presentation of an anniversary sculpture and awards to selected customers. A spectacular show put the guests in the mood for the anniversary celebration held at the „Dongguan Guanlanhu Mission Hills” resort. Next, Arburg Managing Director Sales Gerhard Böhm extended a warm welcome to the guests. 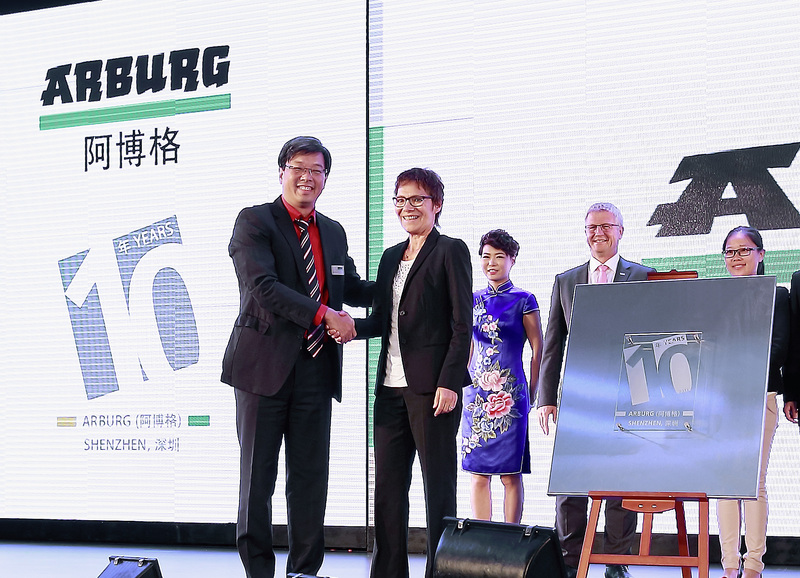 In his speech, he congratulated the Arburg team on their anniversary and thanked the staff and customers: “The fact that we are celebrating ‘10 years of Arburg Shenzhen’ today is thanks to our committed team here and especially also to our customers. Without their trust in Arburg and the successful cooperation over the past years, the subsidiary’s fantastic development would never have been possible.” He added that the occasion confirms the value of the ongoing investments made by the company in the Chinese market. handed them the “10 years of Arburg Shenzhen” anniversary sculpture and thanked the entire team for their great commitment and tireless efforts on behalf of Arburg and the owning Hehl and Keinath families. During the course of the evening, Gerhard Böhm, Andrea Carta, Arburg Overseas Sales Director, and Tony Zhou, Managing Director of the Arburg subsidiary in Shenzhen presented awards to selected customers in a number of categories. The “Customer Award” for the greatest innovative strength went to Blue Metal Precision Industry (Dongguan) Ltd, the prize for the highest growth potential to Fuzhou Xiaoshenlong Watch Technology Research Co., Ltd and the one for outstanding partnership to MeHow Innovative Ltd. The respective prize winners were presented to the audience in the form of video clips. Further show performances and the presentation of LSR processing on Allrounders from the successful hydraulic Golden Edition machine series, as well as a multi-course dinner rounded off the anniversary celebration. Back in 1991, Arburg founded a subsidiary in Hong Kong, a second one followed in Shanghai in 2004 and further one in Shenzhen only two years later. The team in China has grown accordingly and now counts 78 employees. With 27 service and 10 application technology experts, the competencies have been further enhanced at the local level. In addition to high-quality machine technology, the Arburg customers in China thus also benefit from up-to-date and comprehensive expert knowledge in the fields of application technology, production efficiency and automation. German machine manufacturer Arburg is one of the world’s leading manufacturers of injection moulding machines with clamping forces between 125 and 5,000 kN. This is complemented by robotic systems, customer- and industry-specific turnkey solutions and further peripheral equipment. An innovative additive manufacturing system developed in-house was added to the plastic processing range in 2013. In keeping with its motto “Arburg for efficient injection moulding”, the company places the topic of production efficiency at the centre of all its activities, taking into account the entire value-added chain. The objective is to enable the Arburg customers to manufacture their plastic products, from one-off parts through to high-volume batches, in optimal quality and at minimal unit costs – e.g. for the automotive and packaging industries, communication and entertainment electronics, medical technology and the white goods sector. An international sales and service network ensures first-class, local customer support. Arburg is represented by its own organisations at 33 locations in 25 countries and by trading partners in more than 50 countries. The machines are produced exclusively at the parent company in Lossburg, Germany. Of a total of roughly 2,700 employees, around 2,200 work in Germany. About 500 further employees work in Arburg’s organisations around the world. In 2012, Arburg became one of the first companies to gain triple certification: to ISO 9001 (Quality), ISO 14001 (Environment) and ISO 50001 (Energy).